In the struggling world of 3D printing, is Stratasys or 3D Systems the better buy? 3D printing stocks have been hammered over the past three years, primarily because the industry quickly went from fast growth to big losses that investors didn't expect. But the key companies may still have a bright future as customers figure out ways to incorporate 3D-printed parts into production. 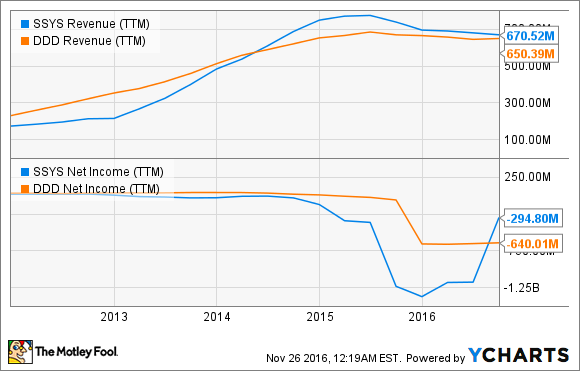 The question is: Will 3D Systems Corporation (NYSE:DDD) or Stratasys, Ltd. (NASDAQ:SSYS) fare better long term? Looking at income statements and balance sheets, there isn't a lot that separates 3D Systems and Stratasys. 3D Systems generated $467.0 million in revenue in the first three quarters of the year, showed a gross margin of 48.6%, and lost $43.6 million. Stratasys generated $497.2 million in revenue in the first nine months of this year, had a 47.1% gross margin, and lost $62.5 million in that time. Neither company has a debt load and 3D Systems has $179.4 million in cash on hand compared to $239.3 million at Stratasys. Financially, they almost look like they're the same company. Strategically, they aren't in entirely different worlds, either. Both companies make everything from small desktop printers to large production-scale printers that use a variety of materials. But it's when they focus their efforts on a corporate level that I think is important. 3D Systems has put a focus on building accessible software and third-party printing services. You don't actually have to own a 3D printer to use 3D Systems' services, which makes the products accessible to more customers. 3D Systems' strategy may be dragging a wider net, but it's also seeking out a less qualified customer in 3D printing. You can see this in 3D Systems' 9% growth in material sales last quarter compared to 12% at Stratasys, despite 3D Systems outperforming overall on revenue. Stratasys' strategy of serving customers who already demand their products could pay off with far more high-margin material sales in the end. In a tough 3D printing market, I have to give the edge to Stratasys simply based on a more qualified customer base. But neither company is particularly attractive given the shrinking top line and net losses each quarter. Until the 3D printing industry starts to grow again, I wouldn't bet much on a recovery because the market overall may not be as big as we once assumed.